After a two-week hiatus, Burger and Fries Friday is back! This week's burger is actually the one I'd planned to make last week but didn't due to other plans. But it sounded so good that I just had to move it to this week's menu. Don't let the appearance deceive you: This burger may look simple, but it's very flavorful and oh-so-juicy. When I initially tasted the sauce before adding it to the pan with the burgers, I was skeptical of the amount of soy sauce. The soy sauce was overwhelming before it cooked, but after the sauce cooked down the flavor concentrated and it was absolutely perfect. 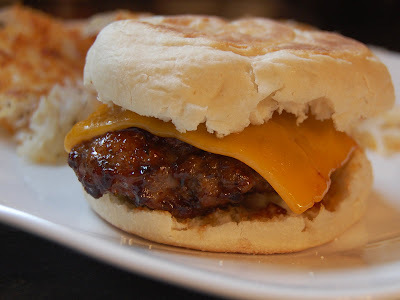 An English muffin is the perfect bread choice for this burger, too, since the burger is kind of breakfast-y, and also because the English muffin has lots of nooks and crannies to soak up the flavorful sauce. I have yet to try a "bad" burger from Rachael Ray. Joe and I both really liked this burger, and it's one I will definitely make again! 2. In a large mixing bowl, combine the ground pork with the ground sage, thyme and cayenne pepper. Mix well with your hands, then form the meat into four equal-size patties. 3. Pre-heat a large skillet with the olive oil over medium heat. Sear the patties on both sides, then add the ketchup, Worcestershire sauce, soy sauce and brown sugar to the skillet and let the mixture cook down until it coats the burgers and becomes saucy, about 5 or 6 minutes. 4. Place the English muffin halves on a baking sheet and pop them under the broiler to toast. 5. Place a piece of cheddar cheese on top of each burger to melt. Serve the burgers on the toasted English muffins topped with a spoonful of the sauce. Your burgers are always winners. RR does have some great ones!